JUMP INTO A PLACE WHERE YOUR HEART ABSOLUTELY SINGS! Join us in this amazing, life changing, exquisite adventure into the mystery! The overall experience for me and my Girlfriend was and is beyond words. The experience not only did something for us each as individuals but, for our relationship it added a new level of intimacy. 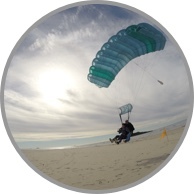 The breakthrough process offered prior to the jump gave us a metaphor that we can now us as a communication tool combined with the video and photos captured the moment forever…. I highly recommend this lifetime experience, this wasn’t a tourist attraction its been a lifetime investment!!!!!! In fact, WE GUARANTEE our breakthrough strategy will have you answer the question and find the solution. We help you make it a reality. Place your details in the form below and someone from our team will be in touch very soon for a chat! Anytime we transcend limitation, we breakthrough. 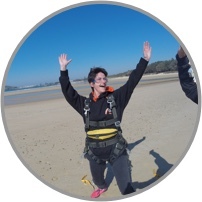 Here at The Breakthrough Crew we use skydiving as the experiential energetic catalyst to explore who we really are, to address fears or phobias and breakthrough or even to shift the programming of society that does not fit. Our form of breakthrough incorporates creation, with the depth and understanding of personal work and personal growth. One coaching session looks at what’s inside you, paying attention to your dream. Once this is clear we use the power of your dream connected with your brilliance and breakthrough. 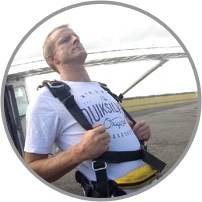 In the culmination of this new place we can do anything – even jump out of a plane. We can approach this breakthrough with a whole new awareness. An awareness of self. An awareness of working on the most important relationship we have – our relationship with ourselves. A relationship with another can only be complete when I am happy with my relationship to myself. WITH THAT AWARENESS, WE JOURNEY TO THE PLANE. We go to the plane aware of the journey we want, of how we want to feel and with the courage to take that step and bring those feeling and wants to reality. 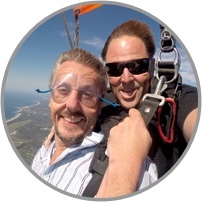 Then as we sit outside the aircraft with our tandem master we make a choice. Then we jump – we leave the plane – we leave our old way of being on that plane. As we leave the plane its an opportunity to embrace the energy and intensity of that moment. That moment is an acceptance of what is. And acceptance that I’m in control of my life. I can choose. This process can be scary and takes courage to accept. During this time we are often defying what society sees as common belief. Breaking through programs that we have learned and believed since we were a small child. 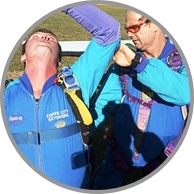 So the skydive simulates the process of courageous acceptance, a willingness to step into something we don’t know and embrace it. Leaving behind what we believed to be our comfort zone. Leaving behind that warm fuzzy place that we have created for ourselves to hide in. That place that has served us well and helped us get through difficult times. Now is the time to embrace our brilliance and step into our new way of being! Once the canopy opens welcome home! Floating above the coastline, basking in the beauty all around, mother earth welcomes us as we land on the beach. Feel the power of your experience, we anchor this energy so it is yours to take home. 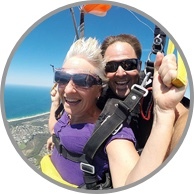 At Coffs Skydivers we offer personal and group breakthrough sessions – our coaches have decades of experience in personal training and development. It really is a life changing experience! Click below to book a breakthrough session. 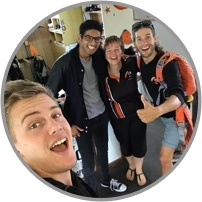 Arrive at Coffs Skydivers and meet the team, including your Breakthrough Coach. 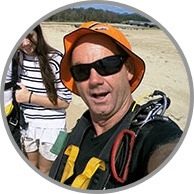 LET’S GO SKYDIVING – CATALYST FOR BREAKTHROUGH! TIME TO HEAD OFF TO INTEGRATE THIS INTO YOUR LIFE! Expect to be exactly where you are, your current place on the path. Expect to dream where you will go next and create it. Expect to be excited with whatever turns up so you can freely be in the experience and harness the hidden treasures. Expect to feel, Happiness, joy, anger, sadness and be ok with them all as you journey. Expect to be compassionate and empathetic to yourself and those around you, as you develop connection to yourself and others, you can only remember as a child and finally, expect to pass on your discovery through humility of remembering your very own essence. No matter what stage you’re on remember, if there is a destination, its beyond this human experience, so enjoy the journey home. 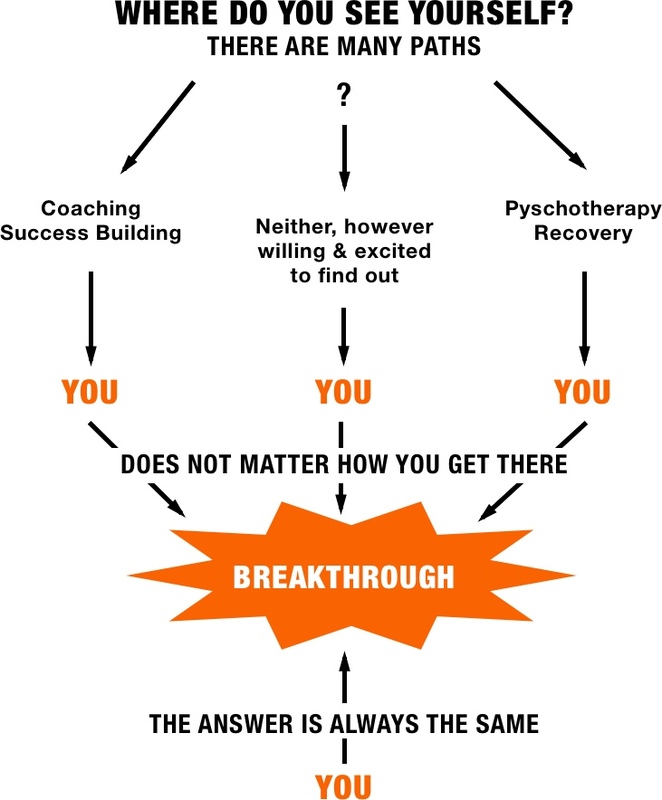 Depending on who you are and where you are in your journey, your breakthrough can take one of two (or a combination of both) paths – Coaching or Psychotherapy. Read the tabs below to get an understanding of how we approach each of these processes. To clarify what you want. To understand your current reality. To develop your own options. To develop your plans, about what you want to do. Once you are able hear and understand your wants and needs, you are then coached to design a strategy to get from where you are now to where you want to be. A system that is designed by you, is extremely powerful and much more likely to integrate and be sustainable into your world, as it will be filtered through your purpose and values, this work is earned and owned you, opposed to advice that has been gifted and is from the reality of another. Our coaching style comes form culture of wellness; you do not need to be “Fixed” because you are not “Broken”. From a culture of wellness and the right questions you begin to see things from a different perspective, looking in from the outside, from another angle, what happens next can be described as magical. With this new perspective and a clearer understanding of how to achieve your wants/needs and be on purpose, it is time to set some goals. Using a metaphor, it is time to draw a line in the sand, step over that line and move into the next phase of your life! A current state of being, where the journey starts, to what’s going on now? Where are you now? What is your situation? What are your resources? What are your relationships and what have you got now? Where the journey is heading as, a journey may be fruitless without knowing where you want to go? Where do you want to be? What do you want to achieve? What is your dream/ vision? Precise, detailed, what exactly is it that you want to achieve? How will you know when you have achieved your goal? What will it look | sounds | feel like? What criteria will you use to know you have achieved your goal? Can you achieve this goal? Is it a real possibility? How will this goal help you? What is its relevance? What else is connected to this goal? By when do you want to accomplish this goal? Setting this creates a boundary, and a holding, for this task. It brings the vision into sharper focus, and allows clearer thinking to arise. Can you remember being a child, maybe 3, 4 or 5 years old? Playing blissfully, not thinking about what tomorrow, next week, month or year would bring. Simply enjoying now, feeling free to show emotion, create, dream, pretend, be the authentic you as it was the only you, you knew. Creating reality just the way you wanted it, giving yourself permission to be wherever you were in your spiritual, mental and physical development, not worrying about the path of transformation rather being in the flow of life? YES? You were possibly confused, reactive, maybe started to introvert or maybe acted out and consequence came and you were scolded or condemned. You started creating stories of what you should be (based on your conditioning), to fit into the mould, size, shape, and intelligence expected of you. Social standing became a thing, fashion, coolness and financial hierarchy became a thing and before you knew it you were lost, (you may have developed negative habits or addictions along the way), you felt constricted, trapped, stressed or pressured but didn’t realise it. Where had YOU gone, where was your freedom to be you, the authentic, unconditional, incredible essence you arrived with? I have witnessed many people on the transformational journey home and I’ve realised one thing in particular. We are all looking for the same thing, something we were born with, our pure essence, unconditional love, freedom and belonging. We are all looking for that best friend we knew as a child, ourselves. This journey through the art of coaching will be a journey home. A journey filled with challenge, emotions, beauty and pain. A journey you can only ever be complete on before you begin, because you are right where you need to be, every moment, every step, you are who you are right now and that’s ok, totally ok, for it IS…..!! So welcome, buckle up (if you desire) and enjoy the journey of recovery, recovering your essence through transformative coaching. Are you willing to dare, can you trust yourself to ride the wave, if you’re reading this, if you’ve found us, the answer is yes, you’ve just recovered a part of yourself today and you’re hungry for more, welcome! OMG the house is on fire, run, leave everything, take only what you can’t live without. In this step I realise I can’t keep doing the same thing and expecting a different result. The drug of disappointment is wearing off, I’m getting over it and I’m starting to get inquisitive, a glimmer of hope, there might be another way. Rummaging through the rubble from the fire, releasing old patterns of conditioning and agreeing to thank them for creating the window of light through the darkness and for the tools of resilience, the brilliant strategies and coping mechanisms I have created to stay alive through the wood chipper, that I’ll rely on to give me the ability give me the ability and discipline to create change with ease and grace. This stage begins to transform knowing to being. I create new ideas of possibility, I change my relationship to fear by accepting, acknowledging, appreciating then choosing and acting. 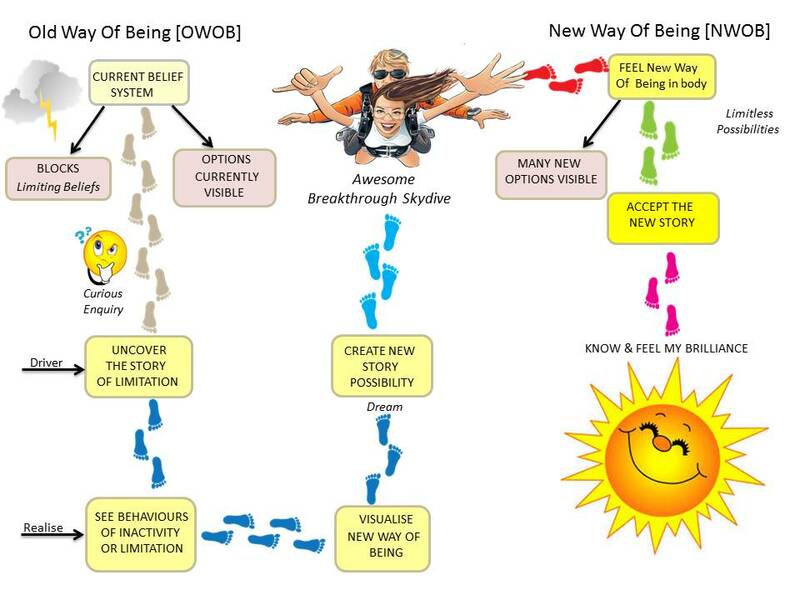 New patterns of positive behaviour emerge and wins arrive creating new platforms of positivity to journey from. This stepping stone is reflective, it’s about gratitude for all that is, was and will be. As mining of theses precious gems, ourselves, rests, Self love, empathy, the knowing that I can’t ever not know again, become a state of the conscious mind and I realise awareness is curative. It’s spiritual pay day. This stepping stone I have found the most rewarding. Our breakthrough package is available to individuals, small or large groups. For groups of more than 4 people, make and enquiry and we can discuss costs based on the size of your group.